rip off, I decided to have a go, thinking "here's another useless Japanese game converted for the British market." And how wrong I was. Straight away I was hooked on playing the game, I couldn't stop myself, I realised that this game was deceptive like classic games such as Bomberman and Zelda. It may look stupid on the outside but it's totally additive once you get in there. 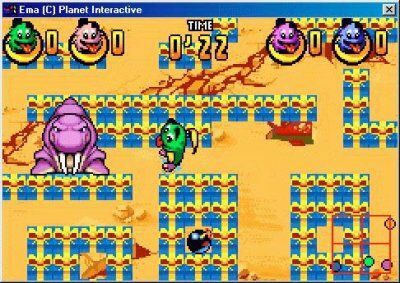 If you are a Bomberman survivor then Planet Monsters will be familiar to you. You play a little furry green monster battling against four others of the same species until the last man stands at the end of each level. The game takes place in a series of labyrinths filled with mutating monsters and other dangers. You have to decide if you're going to play strategically or go out and out massacre - whatever your game plan, it will test the grey matter. There are eight worlds (or universes) to complete to finish the game but don't forget there is a mountain of strange, constantly appearing monsters, three opponents, the labyrinths and eight bosses also to be beaten to finish too! The graphics and colours of the game are spot on. The characters are cute and very well designed, and wouldn't appear out of place in a cartoon! The animal characters are great to watch, at the beginning of the levels they are cute and nice but slowly over the period of the game they mutate into nasty little bastards (A bit like the Cookie Monster crossed with Christine Hamilton). This is a fast paced game tagged with the usual annoying soundtrack and sound effects. It may start as any other game, but quickly leads into creating strategies, tense moments and very long game play. Another good feature of the game is that you can challenge up to four-players with the Game Link, providing more fun once you've completed the game. 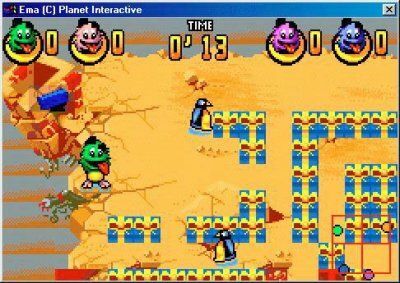 I have noticed that this game appeals to the old generation of computer game players, those who can remember Bomberman, Pengo and Zelda. It's a simple, addictive game that relies on good game play and not the usual star endorsements that appear too often on bad games. I can see the younger generation ignoring this release but they are missing out. Planet Monsters may look kid like but that doesn't mean it's necessarily for just kids!